Courage, strength, energy and action, une grande passion; resort to magick, the use of magical power. Those Paths on the Tree which are horizontal and join together a male and female Sephirah are termed Reciprocal Paths. The fourteenth Path was the first of these' this nineteenth Path is the second, linking Might with Mercy, Justice with Love. This letter means a "Serpent ", Its zodiacal sign is Leo, the Lion. Pasht, Sekket, and Mau, are attributed because they are cat goddesses. Ra-Hoor-Khuit is another correspondence, representing the Sun which rules Leo. Demeter and Venus as Agricultural Goddesses, are also attributed to Teth. Its animal is, of course, the Lion; its flower the Sunflower; its jewel the Cat's Eye; and its perfume Olibanum. Purple is its colour. 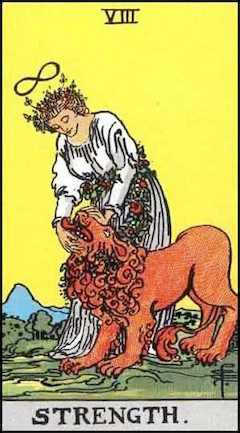 Its Tarot card is VIlI -Strength, showing a woman crowned and girdled with flowers, calmly and without apparent effort, closing the jaws of a lion. In view of the "Serpent" and "Lion" correspondences, some authorities assume a phallic connotation for Teth, The Serpent and the Lion are of particular importance in the study of alchemical literature. In modern psycho-analytic theory, the Serpent is lucidly recognized a symbol both of the phallus and the abstract concept of Wisdom. Solider with ducal crown riding a crocodile. Lion-faced man riding a bear, carrying a viper. Trumpeter with him. Lion on horse, with serpent’s tail, carries in right hand two hissing serpents. Warrior with ducal crown rides gryphon. Trumpeters. The Daughter of the Lords of Truth. The Ruler of the Balance.